Kent Baker presents during Kogod's first Kent Baker Day. Just a few weeks ago, Kogod School of Business at American University hosted the first annual H. Kent Baker Day. Named after the long-time Professor of Finance, this new celebration was a chance for students, faculty, alumni and others to hear from the esteemed Professor Baker himself. Baker's lecture was titled "Bridging the Gap Between Theory and Practice in Finance." 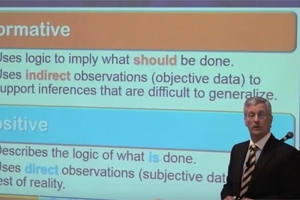 According to a discussion with Baker after the lecture, the purpose of the session was threefold: "One, to discuss whether a link exists between financial theory and practice; two, to examine the evolution of academic fiancé from "the old finance" to "modern finance" to "the new finance"; and three, to explain the role of survey research in building a bridge between financial theory and practice." The first Kent Baker Day was an idea generated by Professor Jeff Harris, Chair of the Department of Finance and Real Estate, but it took a group effort to promote the event. Along with the lecture there was an impressive display of Professor Baker's books, a reception and other activities. In speaking with Professor Baker, he emphasized that, "what I want my students to take away from my presentation was how theory relates to practice and the evolving nature of finance over the past half century." He also used parts of his lecture in his finance classes. Professor Baker has been a faculty member at Kogod for more than 40 years and this is the first time he can recall a day being set aside for a faculty member. "As a University Professor, I was delighted to give this presentation and honored that Kogod declared a "Kent Baker Day," said Professor Baker. "I was also very pleased that so many people took time from their busy day to attend my lecture or to send their best wishes. However, other Kogod faculty and staff are highly worthy of being recognized in a similar fashion. Hence, I hope that "Kent Baker Day" represents only the first of many other "days" set aside to provide special recognition to those who have done so much for Kogod, AU, and their respective professions." But Professor Baker was quick to point out, "Recognition shows that some one cares and makes an effort to acknowledge the strengths and accomplishments of others. As Maya Angelou once wrote, "People will forget what you said ... forget what you did, but people will never forget how you made them feel."